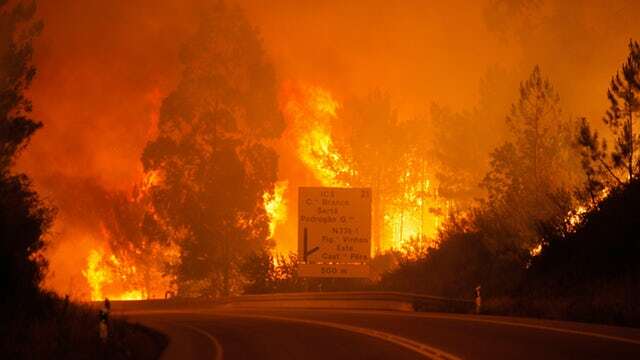 Portugal’s prime minister, António Costa, described the blazes – which have injured dozens more people – as “the greatest tragedy we have seen in recent years in terms of forest fires”, and warned the death toll could rise. Three days of national mourning were declared. A fire in the municipality of Pedrogao Grande has left 25 people dead. 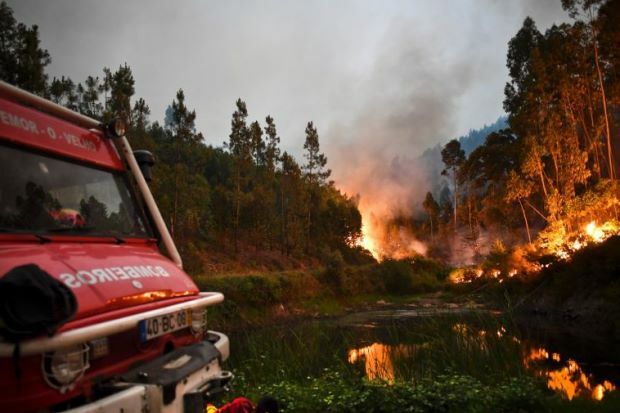 Several hundred firefighters and 160 vehicles were dispatched late on Saturday to tackle the fire, which broke out in the municipality of Pedrógão Grande before spreading fast. Spain dispatched two water-bombing planes on Sunday morning to aid the Portuguese fire service, while France sent three aircraft. At least two Britons were among the injured receiving treatment for minor burns and smoke inhalation. Both were later discharged from hospital. The Iberian peninsular is sweltering under a severe heatwave, with temperatures exceeding 40C (104F) in some regions. 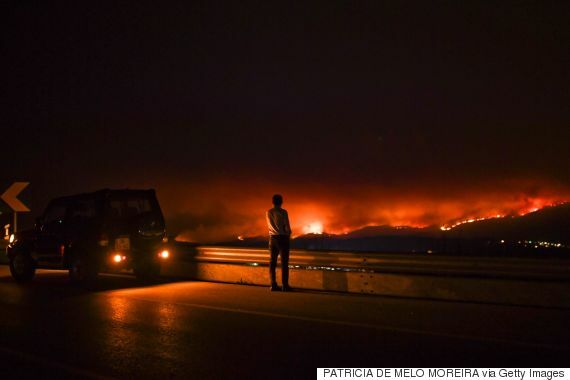 About 60 forest fires took hold across Portugal on Saturday night, with 1,700 firefighters battling to put them out. The initial death toll was thought to be 62 but Costa later said that 61 people had died, as one victim had been counted twice by authorities. 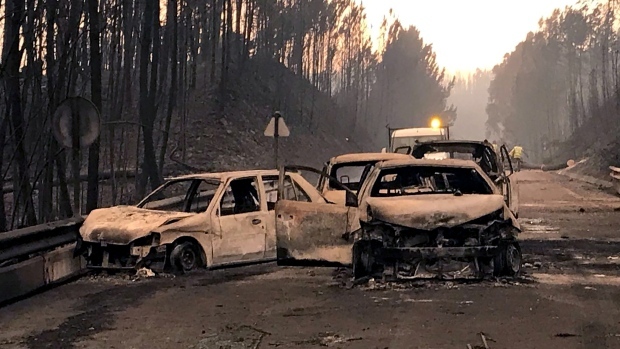 The secretary of state for internal administration, Jorge Gomes, said 22 people burned to death in their cars after becoming trapped by flames on the road between Figueiro dos Vinhos and Castanheira de Pera. Three others died from smoke inhalation. More than 50 people were injured overall, with 18 of them taken to hospitals in Lisbon, Porto and Coimbra. Five of them – four firefighters and a child – were seriously injured. Gomes said the flames spread “with great violence”, moving out on four fronts. Dry thunderstorms could have been the cause, according to Costa. The government said it was unlikely that the fires had been started deliberately. A huge wall of thick smoke and bright red flames towered over the top of trees near houses in the wooded region. Isabel Brandao, a local resident, told the Associated Press she feared for her life. Valdemar Alves, the local mayor, said he was stunned by the number of deaths. “This is a region that has had fires because of its forests, but we cannot remember a tragedy of these proportions,” he said. Dozens of people who fled their homes were taken in by residents of the nearby municipality of Ansião. “There are people who arrived saying they didn’t want to die in their homes, which were surrounded by flames,” Ricardo Tristao of Ansião told reporters. In Rome, Pope Francis led thousands of people in silent prayer for the victims of what he called the “devastating fire” in Portugal, while the Portuguese football team offered its “deepest sympathies to the families, friends and loved ones of the victims of the fires”. A number of villages were affected by the main fire and evacuation procedures had been put in place for some of them, according to Costa. Officials were not immediately able to comment on the extent of the damage. The prime minister said a period of national mourning would be announced shortly. President Marcelo Rebelo went to the Leiria region to meet families of the victims, “sharing their pain in the name of all the Portuguese people”, he said. Firefighters did all they could when faced with the blaze, he added. Portugal, like most of southern Europe, is prone to forest fires in the dry summer months. The country was hit by a series of fires last year which devastated more than 100,000 hectares (247,000 acres) of the mainland.